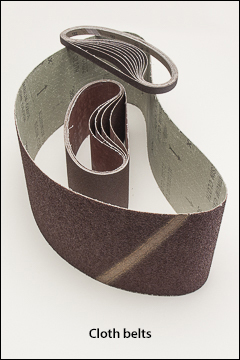 Abrasive belts, abrasive rolls, PSA rolls, aluminum oxide belts, aluminum oxide rolls, sandpaper. These are a few popular aluminum oxide belts. Belts are also available in silicon carbide, zirconia alumina, and ceramic on a wide range of backing material from 1/2" to 16" wide. Please contact us to discuss belt sizes not shown on this page. We can send you product selection guides to show the cloth and abrasive combinations that work best for different applications. Aluminum oxide abrasive, open or closed coat, and resin bonded to X or Y weight heavy-duty cloth. These belts are designed to operate: at 6,000 SFPM–surface feet per minute. Pricing shown is for each belt. Sold by the pack. Minimum order is one pack. WARNING: Proposition 65 Label for belts . Aluminum oxide abrasive, cloth backing, and resin over glue bond. Rolls are 50 yards long. Please call us for pricing on any additional grits you use. 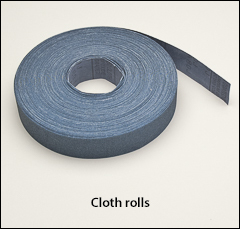 Hand-held pads are available for these rolls on our Hand-held pads page. WARNING: Proposition 65 Label for cloth-backed rolls . 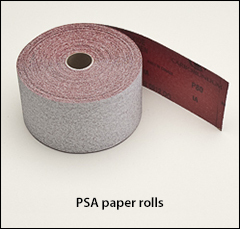 are P-grade heat treated aluminum oxide abrasive, resin bond, on heavy B-weight PSA paper backing. File boards are listed on our Hand-held pads page.